How to set password for users in AIX using single line command? Is there any way in which I can set the password for a newly created user account in AIX in a one line command? I don't want to give any prompt to the user. If there is a command, it should set the password to that user without asking anything on the screen. I need to use that command in another technology like Java/.Net. I need to create the accounts with password on a AIX machine at run time by executing one line of code where I can pass parameters. Suppose a user is giving a username in the text box of a Java application and in the background the command needs to be executed which will create the user accounts(with the password) at a remote AIX server. I am successful to add a user account, but setting the password is something where I am stuck. 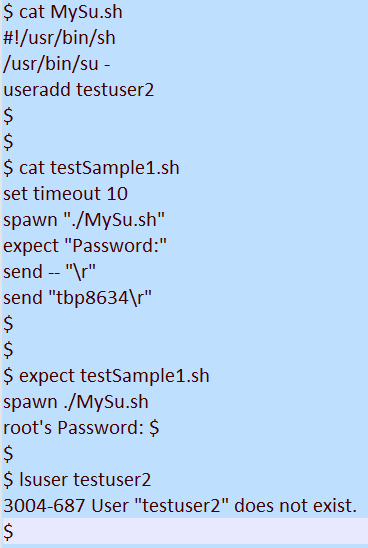 The chpasswd command administers users' passwords. The root user can supply or change users' passwords specified through standard input. Each line of input must be of the following format. username:password Only root users can set passwords with this command. Not the answer you're looking for? Browse other questions tagged password aix useradd or ask your own question. How to gain root privileges for specific user if we have root password? Why does the debian installer force me to use a username starting with a-z while adduser doesn't enfore this?